This week’s recipe for the Food Matters Project, selected by Erin of Naturally Ella, is a simple and versatile hummus…served hot! Hummus was a staple in my college kitchen, and continues to be a key player in my small kitchen today. So I jumped at the opportunity to experiment with new ways of serving my favorite dip. Leave it to Mark Bittman to take a humble dish like hummus, and elevate it to something more complex, elegant, and dare I say—delicious?! The main recipe itself is reliably straightforward—chickpeas, tahini, lemon, olive oil, and garlic blended together into a smooth consistency that begs for a warm piece of pita. The brilliance (and warmth) comes later with the add-ins and final presentation. Bittman provides a list of possible ingredients to spice up (literally) the original recipe, including roasted bell peppers, roasted garlic, cheese, nuts, olives, spices and pesto. If I’ve learned anything from religiously following Bittman’s Minimalist columns throughout the years, it’s to follow your flavor instincts. 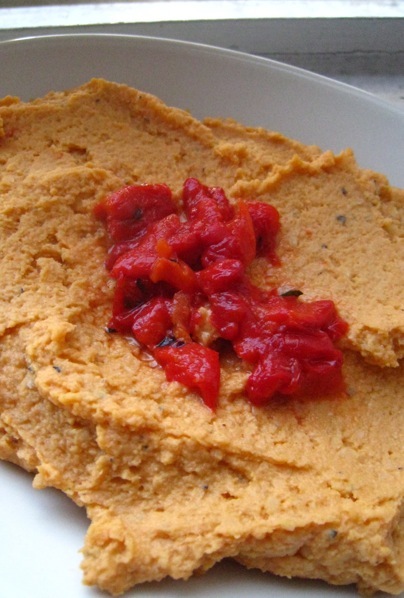 I’m a sucker for roasted red pepper hummus, but wanted cut the sweetness peppers add. Going off hummus’s Mediterranean roots, I folded in minced preserved lemons, which added a subtle tang to the dip. Once the flavors are set, the creamy mixture is heated on the stove or in the microwave then served warm immediately. 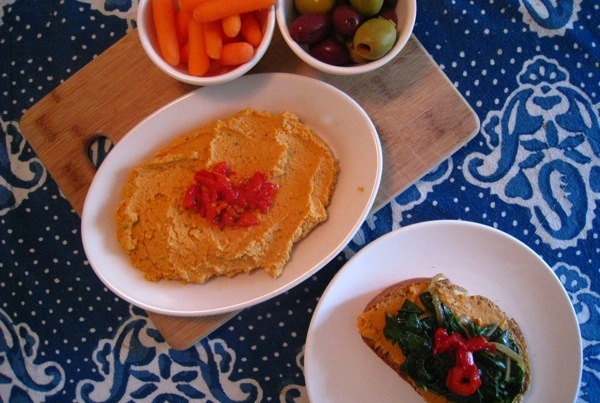 I was wary of enjoying this warm dip with my favorite crisp carrots, so I opted for an open face sandwich, playing off my love of hummus in wraps. 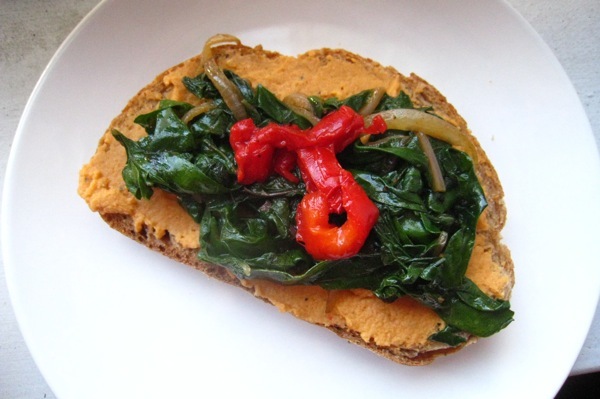 I spread the hot hummus on a piece of crusty bread and topped it off with sautéed greens and onions. The perfect light lunch! And now I’ve got a container of delicious hummus in my fridge, waiting to be reheated and rethought into another sandwich, appetizer, or snack! For the complete recipe, see page 356 of the Food Matters Cookbook, or check out Naturally Ella—and take a look at other FMP twists on this small kitchen favorite! Preserved lemons… yum! Did you preserve them yourself? If so, I’m jealous. If not, where do you get those? I preserved them myself! Originally got the idea from a minimalist column, but actual recipe is from Amanda Hesser’s Essential NY Times Cookbook. Highly recommend making or finding some–great addition to your pantry! That preserved lemon in the hummus sounds so delicious. For me the flavor that makes or breaks a hummus is the amount of lemon juice, so this has to be wonderful! Preserved lemons are genius – I am definitely going to try that! Yum, I’ll have to try making hummus with preserved lemons – great idea. Love your combination. I like to add preserved lemons to my hummus as well. It gives it a great taste.